The Inversion Sling or Yoga Swing is a yoga prop that gives the practitioner a safe and fun way to strengthen each posture. It looks like a hammock but mainly supports your pelvis so that you can move your body horizontally, vertically or upside down. You are able to try any yoga posture with this prop. On either side, there are three arm and leg handles at different heights. Improve core strength, flexibility, all while having some fun. Use it indoors or take it with you to the beach or the park. At just 2.9 lbs, you can take it anywhere and hang it in less than a minute. 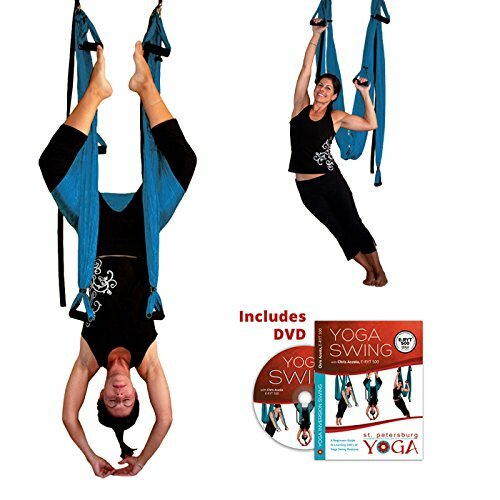 About the DVD Included: This Swing + DVD combo comes with a copy of the DVD Yoga Swing: A Beginners Guide to Learning 100's of Yoga Swing Postures. This DVD is an easy-to-follow Yoga Swing series - designed for joint and spine decompression, as well as gaining core strength. Through safe and mindful sequencing, long-time Yogi Chris Acosta shows you how to approach the Yoga Swing as a full Mind-Body healing practice. If you have any questions about this product by Gravotonics; St. Petersburg Yoga, contact us by completing and submitting the form below. If you are looking for a specif part number, please include it with your message.